Wind erosion climatic erosivity is an important parameter to assess the possible effects of climatic conditions on wind erosion. 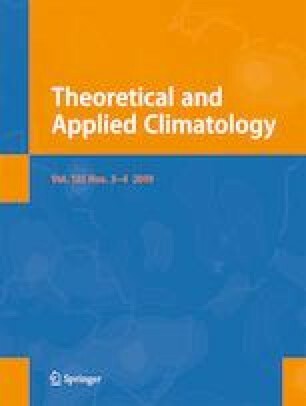 In this paper, the wind erosion climatic factor (C-factor), which was used to quantify the wind erosion climatic erosivity, was calculated for the period 1960–2014 based on monthly meteorological data collected from 101 stations in the farming-pastoral zone of Northern China. The Mann-Kendall (M-K) test, trend analysis, and geostatistical analysis methods were used to explore the spatial and temporal characteristics of the wind erosion climatic erosivity in this region. The result suggests that the annual C-factor, with a maximum of 76.05 in 1969 and a minimum of 26.57 in 2007, has a significant decreasing trend over the past 55 years. Strong seasonality in the C-factor was found, with the highest value in spring, which accounts for a significant proportion of the annual C-factor (41.46%). However, the coefficient of variation of the seasonal C-factor reaches a maximum in winter and a minimum in spring. The mean annual C-factor varies substantially across the region. Areas with high values of the mean annual C-factor (C ≥ 100) are located in Ulanqab and Dingxi, while areas with low values (C ≤ 10) lie in Lanzhou, Linxia, Dingxi, Xining, and Chengde. Spatial analysis on the trend of the C-factor reveals that 81% of the stations show statistically significant decreases at a 90% confidence level. An examination of the concentration ratio of the C-factor shows that the wind erosion climatic erosivity is concentrated in spring, especially in April, which makes this period particularly important for implementing soil conservation measures. This research was partially supported by the Natural Science Foundation of Jiangsu Province (Grants No BK20160953). The meteorological data was provided by National Meteorological Information Center of China Meteorological Administration. Their generous supports are greatly appreciated.